"Lots of brown sugar gives this pumpkin pie a rich, deep flavor." Beat eggs lightly in a medium bowl. Add pumpkin, sugar, cinnamon, nutmeg, ginger, and salt. Blend thoroughly, then beat in milk. Pour into pastry-lined pie plates. Bake in preheated oven for 30 minutes. Reduce the heat to 325 degrees F (165 degrees C) and bake until set, 20 to 30 minutes more. Chill before serving. This airy, no-bake pumpkin pie will make you the star of Thanksgiving dinner. 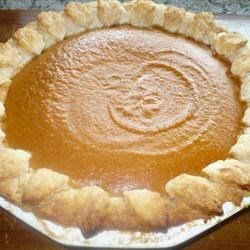 I'm not a big fan of pumpkin pie, but I tried this recipe for my daughter. Loved it! It's a hit! Nice and fluffy. Be sure to cover the crust while baking. Cooking time is way off, and we added 1/4 teaspoon cloves for a more complex taste.